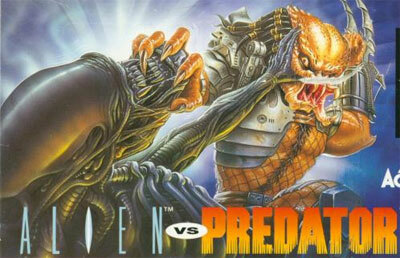 Based on the Alien VS Predator comic book series. During the 25th century, mankind has colonized many planets. On one of these, New Shanghai, strange creatures have been discovered. These Aliens cause much havoc. New Shanghai initiates a distress call to other planets in the galaxy. A cloaked ship belonging to hunting creatures known as Predators intercepts the message. The Predators on board decide that these strange Alien creatures might make worthy trophies for the collection. The player takes the role of one of the Predators. The Predator will fight through several levels of alien creatures in a side scrolling manner. The Predator's ability includes attacking, jumping, sliding and firing bolts from it's shoulder cannon. Additionally, the shoulder cannon can be charged up to unleash a devastating attack that also harms the Predator. Most aliens will drop power-ups which include health, trophy skulls, a double edged throwing weapon, throwing spears and active camouflage. Boss aliens wait at the end of most levels.